In the tracker view, the most recent formative assessment drives the current mastery level that appears in the tracker. District Benchmarks work a little differently. When the administrator makes a benchmark available it appears in your tracker as a black column. Once the benchmark has been assessed, students' overall score and percentage show up in the black column. The difference is the results of the Benchmark do not determine the current mastery level that you see in your tracker. 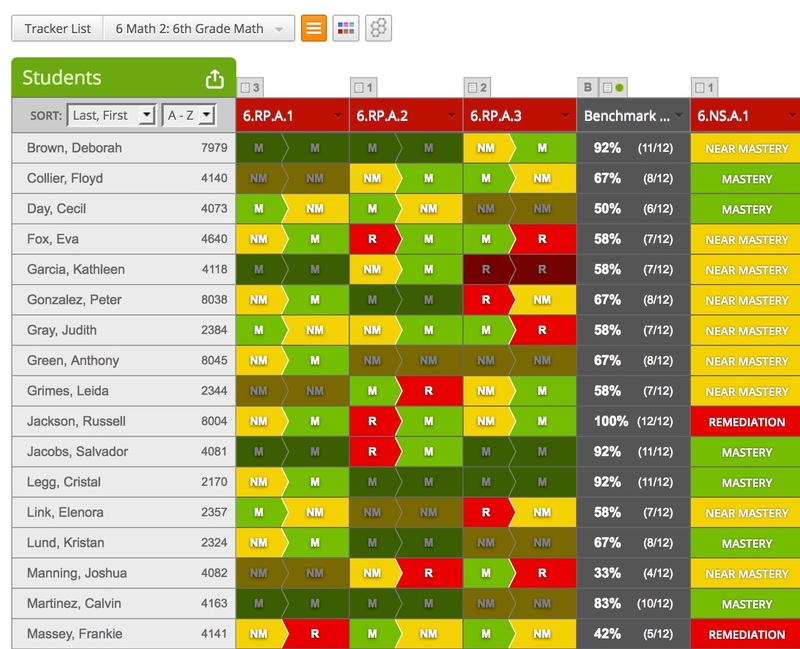 Instead you have the option to compare the benchmark data with the data from your formative assessments. Select the tracker that has the Benchmark and the data you want to compare. Hover over the benchmark title bar and click compare. You will see a comparison of student's mastery levels as determined by your formative assessments along with the mastery levels of the district benchmark. When the compare feature is selected you will see your students' formative data on the left of each column and the benchmark data on the right. If the mastery level is grayed out then the student scored at the same mastery level for both the formative and benchmark assessments. If the mastery levels are in full color, then the student scored at different mastery levels on the formative and benchmark assessments. This comparison gives you the ability to see discrepancies between your formative data and the district benchmark data that can help you evaluate your instruction. When you finish viewing the data, click compare off in the benchmark title dropdown to return the tracker to it's normal view.